New roof coming soon! The moment you drive up to this property you'll be wowed w/it's curb appeal & immediately be ready to make this one your Home! Stepping inside you appreciate a great floor plan & will be greeted with beautiful stained woodwork & crown molding. Laminate wood flooring in entry, study, hallway & 3 bedrooms. Kitchen, dining area & laundry room have gorgeous tile flooring w/wood look. Kitchen is spacious w/room for the family featuring Island, eat-in, built-ins, under cabinet lighting, gas stove, built-in microwave & oven. Laundry room w/sink & clothes hanging space! Study w/library doors & built-in cabinets & desk. Large living room w/stunning fireplace stained wood trim & accent panels. Master suite is oversized w/it's bathroom offering double vanities, jetted tub, separate shower & australian closet. 3 car garage is spacious & equipped w/2 garage openers. 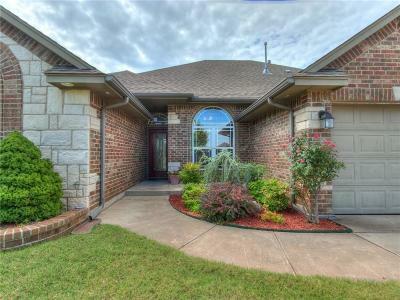 Outdoor living w/nice covered patio, storage shed, open decking, large side yard w/above ground pool.